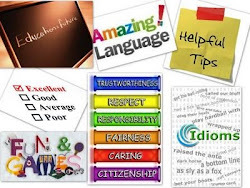 English Teaching Zone: Classroom discipline - Catch them being good technique!!!! Classroom discipline - Catch them being good technique!!!! "Johnny loves negative attention. I know he does those things to get me upset and make the class laugh. His classmates think he's cute when he does something to distract me from the lesson and I have to call him on it." Sound familiar? Some children are disruptive because of the attention their disruption receives, whether the attention is from you or from other classmates. 1) Identify instances of disruptive behaviors. 2) Identify instances of nondisruptive and appropriate classroom behaviors. 3) Implement the beeper system (explained below) at the start of each class period. When the beeper sounds, praise a number of students (including the children who are the focus of your concern) if they are not engaged in disruptive behavior. 4) When a child is disruptive, ignore the disruptive behavior (unless the nature of the behavior cannot be ignored). 5) At the same time you are ignoring a child's disruptive behavior, direct your attention to others who are being appropriate and praise children who are adjacent to the target child for their appropriate behavior. 6) If a child is engaged in severely disruptive behavior, remove him or her to a time-out area for a short period of time. The first step in implementing this technique is to identify the types of behavior that are disruptive. These are the behaviors you will ignore. Also, at this time, identify those disruptive behaviors that cannot be ignored (e.g., aggression, loud and violent tantrums, etc.). Try to keep this list short. 7) The beeper system involves the presentation of audible beeps at random intervals within a class period. Each beep cues you to scan the class and praise appropriate classroom behavior.This technique provides a certain number of opportunities for children in the class to earn praise. The beeper system works best when a timer is used to present beeps at random intervals for designated periods of time (e.g., 15 minutes, 20 minutes, 30 minutes, 45 minutes, etc.). It will all depend on how frequent the disruptive behavior happens. 8) When the beep sounds, you scan the class and praise the children of concern if they are not engaged in disruptive behavior at that time. You can praise other children for nondisruptive classroom behavior at the same time. You may also want to implement a point system whereby points are given to students who are not engaged in disruptive behavior. When an individual child is being disruptive, withhold your attention from that child. Instead, praise the appropriate behavior of children who are adjacent to the child. For example, "I like the way Johnny and Susan are doing their work. Ashley, you are sitting so nicely." Notice that your attention is diverted to behavior that is appropriate and not to the specific incident of disruptive behavior. After this initial "learning period" there may actually be no more time invested in dealing with disruptive situations than was invested previously. Very often, using this positive strategy merely requires a shift in teacher attention: There will be drastically decreased amounts of attention paid to disruptive behavior balanced by increased amounts of attention paid to nondisruptive behavior. Also, as a child's behavior improves, the need for praise becomes less frequent, thus allowing more time for other teaching duties. Finally, praise for appropriate behavior makes school more fun for the children and motivates them to learn. Consider using healthy doses of praise as a good investment in a child's future in school.